TOC can now be translated into 40 various languages. Just click on the flag of the country located at the bottom of the page – “Translator” – when you’re at the page you want translated. It will also translate the comments posted by our readers. Transcendent, subjective and elusive, our notion of ‘happiness’ is one subsumed in the larger framework of relentless economic growth. That emotional fulfillment is considered too esoteric to enter our national lexicon is not surprising, since a happy man does not accrue value to the GDP – although we presume that a high GDP does a happy man make. The Singapore Story post-independence posits our economic success story, scaling the commanding heights from Third World to First. Monetary and material growth is deeply ingrained within our discourse. Finding means of generating income and then some was and remains the primary existentialist question that Singaporeans face and try to answer, from our formative years to even the recent of times. Arguably, measures ostensibly meant to promote social cohesion and harmony could be read as supplementary efforts to galvanize our economic standing. Singapore takes pride in being sombre, subdued and stable: please, do business with us! But ascribing happiness as a subset of the larger theme of prosperity has its inherent drawbacks. The signatories of the United States Declaration of Independence ‘hold these truths to be self-evident, that all men are created equal, that they are endowed by their Creator with certain unalienable Rights, that among these are Life, Liberty and the pursuit of Happiness.’ Thomas Jefferson, credited for writing the bulk of the Declaration, would have a much larger vision for his ‘pursuit of happiness’ rather than one confined to the tedium detail of ‘prosperity’. We would do no wrong to follow his inspirational lead. The PAP’s focus on economics is understandable, for the economic exigencies of our early post-independent years required a formidable social compact that sacrifices idealism for a spartan utilitarianism. It was necessary to relegate happiness as a marginal concern as the nation laboured in economic toil for its very survival. However, this siege mentality continues to pervade up to this very day, as Michael Barr notes, ‘crises are a routine plot device in The Singapore Story, and are claimed to be intrinsic to Singaporean identity’. From the Communist threat to Islamic extremism, from the dot-com bubble burst to SARS, from 9-11 to H1N1: we are reminded that we are so very fragile; a threat to social stability is a threat to the economy, a threat to the economy is a threat to our very survival. The Minister Mentor is an expert at playing to the gallery of fear. His, and the PAP’s ‘vision thing’, can be uncharitably essentialized as a choice between happiness through economic prosperity under a PAP hegemony, or relative poverty and dire economic straits in a multi-party environment. Again, the PAP’s focus on economics is understandable, because it helps them win elections. By clothing happiness in the dress of economic prosperity and appropriating the contemporary threat of the day into the national discourse, the PAP believes that the intangibles of human happiness and aspirations – with all its connotative ideas of freedom and human rights – can be labouriously avoided. 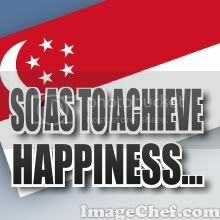 In its defence, Singapore can cite her credible showing in a range of life-satisfaction and quality-of-life indices. Singapore was ranked 11th in the Economist Intelligence Unit’s 2005 quality-of-life index in 2005, and 28th in the United Nation’s 2008 Human Development Index. While GDP per capita figures pose a limited measurement of material well-being, it is conversely true that a comprehensive and credible ‘happiness index’ is hard to develop, given the inherent subjectivity of life-satisfaction. What little clue can be then gleaned from our migration trends. Lee Kuan Yew has lamented that ‘we’re losing about, at the top end, 1,000 a year, which is about, if you take the top 30 per cent of the population, thereabout four or five per cent’. This, in spite of the International Monetary Fund ranking Singapore’s 2008 GDP per capita (in nominal terms) as Asia’s fourth highest – after oil-rich Qatar, UAE and Kuwait, while pipping Japan. The brain drain crystallizes the fallacy of intertwining economic prosperity with happiness. It is telling when even the best of our citizens, poised to emerge as future political and business elites, decide that Singapore – for all the material plunder, riches and opportunities that are potentially theirs for the taking – offers too little, too late. The exodus illuminates the futility of our constantly changing skyline: the relentless (re)construction and (re)development is an exercise in itself for itself, a chameleon vision that sees more wealth in ever towering skyscrapers but little else. John Clammer wrote presciently in 1985 that ‘… expensive projects are begun … change, construction, urgency are the keywords. But why? What is the ultimate purpose of all this construction, all this energy spent changing what has just been finished? Nobody quite knows, for the system seems to require that today’s solution is tomorrow’s problem’. Evidently, in 2009, nothing has changed: everything is still in a persistent flux. Barr and Skrbis describes Singapore as being in ‘perpetual constructionist mode’ – and this infrastructural binge will inevitably fail upon itself; a nation is more than a colossal hybrid of industrial-commercial complexes, whose expansion is afforded by reclaimed sand and an influx of foreign workers. The PAP’s utopia is limited to visions of economic prosperity predicated on refurbished high-input and high-export models, and this narrow pursuit wreaks profound damage to our fledging sense of collective national consciousness. It will be easy to lay the blame on the political elite for their obsession with material development. However, Barr notes an ACNielsen telephone survey of 1000 people in 2002 that ‘found twenty-one percent of Singaporeans harboured “a desire to leave the country permanently.”‘ The primary reason suggested: economic insecurity. And therein lies the problem for Singapore. Whatever the drawbacks of the PAP’s materialism mantra, it is more troubling that Singaporeans acquiesce to this ‘lust for gold’, in the words of the late David Marshall. This obsession with consumerism and material wealth, albeit state-directed, pervades the local psyche that the danger of Singapore being a country of all commerce and industry yet no soul becomes a self-fulfilling prophecy. Marshall warned that ‘there is serious danger in promoting a society in which all merit is governed by gold, where money in the bank account indicates the merit of the individual’. His words should serve as an indictment to both the state and citizenry held in thrall by a materialist national project – the former for crafting a consumerist dystopia, and the latter for acceding to that vision. That patriotism is reduced to a fluctuating anemometer according to the economic winds is a condemnation not only of the PAP’s Singapore, but the nation itself. Lee Kuan Yew does not have to wait another 44 years for Singapore to evolve a sense of nationhood. We only need to wait for Singaporeans to claim the mantle of directing the national project. There is a civic value in defining the national project on our own terms. That remains true regardless of the minutiae and specifics of the vision: the exercise in thinking for ourselves engenders a sense of empowerment, hope and promise. Arguably, the most powerful lesson would be realizing that happiness is possible beyond those found in the Singapore 21s, the Economic Review Committees, the Remaking Singapores and the Renaissance City Plans. And for that to happen, it will require courage, it will require imagination and it will require heart. Only then would we discover that there is promise beyond prosperity, and that our happiness is worthy of more than the digits of our account.